Discover our selection of best Junior Suites in Skiathos. They have been carefully selected for your best experience. 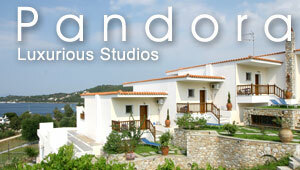 You can search for Skiathos Junior Suites by class, price, and name. They are illustrated with many photos, detailed descriptions, list of facilities and maps. Some propose an online booking engine for real-time bookings on a secured server, while others propose bookings on request. All Junior Suites in Skiathos are presented below and you can find what you need by using the filters on the right side. Appointed with all advanced amenities, the rooms and suites of Kassandra Bay Resort in Skiathos promise a comfortable and lovely stay in the island. Situated on an elevated spot enclosed by verdant foliage, the complex is close to the beautiful Vasilias beach and just 3km from town. Kassandra Bay suites are lavishly equipped with LCD TV, A/C, bath products, fridge, Coco-mat mattresses, beach and pool towels, and private Jacuzzi or pool. What is more, the hotel organizes a vast number of outdoor activities, including water ski and wind surfing.